Don’t get me wrong. I really enjoy cycling, because you experience the piece of town or country you move through so very differently from when you’re traveling in a car, but there has to be a really good reason to make me spend hours on a bicycle. Yesterday afternoon I cycled the 24 miles south from Geneva along the eastern side of Seneca Lake to visit the small Boundary Breaks vineyard that NYWC (New York Wine City) exile Bruce Murray began planting his 18 acre vineyard in 2008. Nearly all my colleagues and the top somms will tell you that young vines cannot give great wines, but I always said the wine is as good as it is, no matter where or when it grew. I cycled at a fair clip and struggled to keep my bike upright in the blustering wind for two solid hours in the hope that the 2014 wines from Boundary Breaks would at least be up to the same level as the first vintages. After all, this young producer’s 2011 198 Reserve was one of my top Riesling discoveries of last year, and the 2012s and ’13 Rieslings had all been good to impressive in quality. That’s quite a track record for such a young producer who was previously in market research! 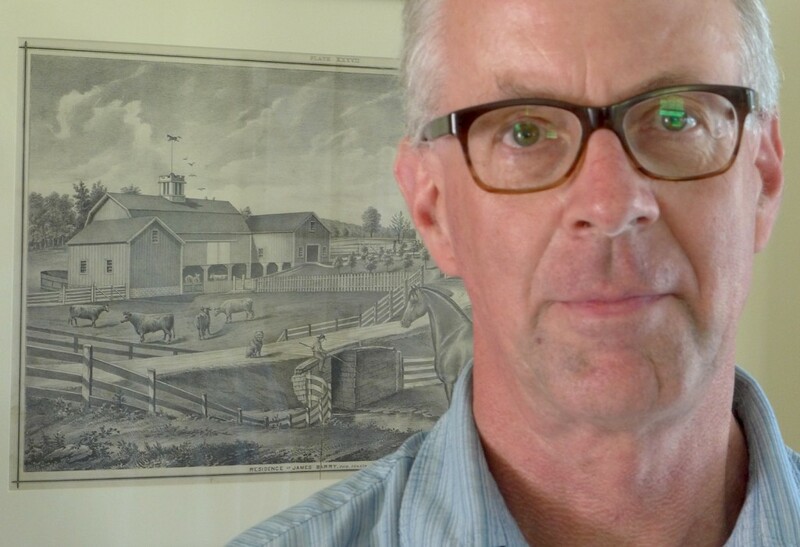 Bruce produced just three wines in 2014, the dry 239, the medium-dry OLN and the medium-sweet 198. Or rather, I should say that, with the very considerable help of vineyard manager Kees Stapel and his assistants, and of winemaker Kelby Russell, he has produced three FLX Riesling masterpieces. I’m now getting a clear picture of the 2014 in this region, and it divides into two contrasting groups of Riesling wines. The first of this is the wines made from grapes picked at the beginning of the long period of fine weather in the fall – picked then because rot was developing and it wasn’t possible to wait any longer – which are quite lean, have high acidity and apple-lemon aromas. Then there are those that were picked at the end of those weeks of fine weather, which are richer, more harmonious with much riper yellow fruit and floral aromas. All the Boundary Breaks’ Riesling grapes were picked in late October and belonged to the second group. They were significantly riper than this producer has so far picked, and when wine producers suddenly see unfamiliar numbers – every wine producer is looking at those number even if they’re also looking at, feeling and tasting the grapes – they nervously ask themselves what this means. For example, it was certainly conceivable that the 2014 Boundary Breaks grapes might have given Rieslings that were too rich or lacked elegance, but that isn’t the case at all. 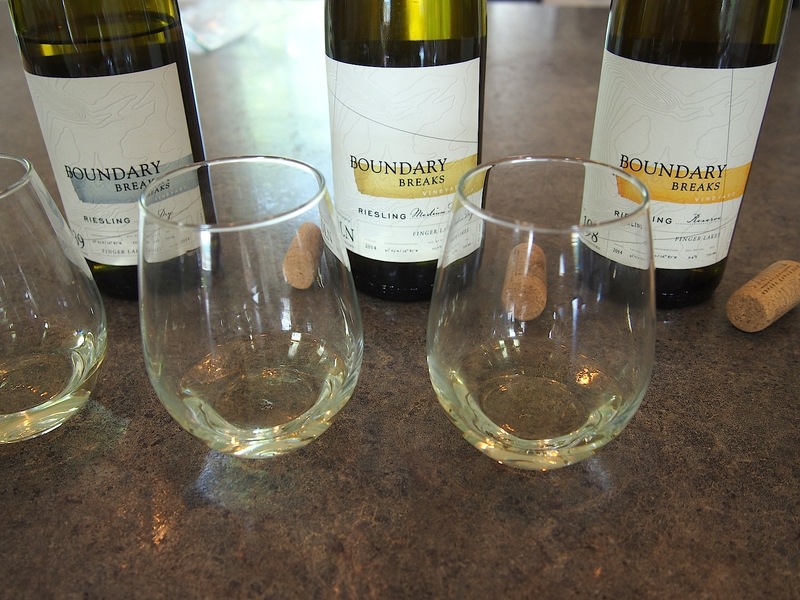 As you can see from the picture above, all three of the 2014 Boundary Breaks Rieslings are pale in color with a greenish tinge, which is not the way Riesling made from over-ripe fruit usually looks. In fact, I consider this the ideal appearance for young, high-end Riesling wines. Because they were bottled just a month ago all three are a little bit shy in the nose, but they got plenty of time to aerate in the glass as Bruce and I talked and they slowly blossomed. That’s exactly how it should be with wines made to retain their youthful freshness as long as possible, and for long aging beyond the first effusive phase of their lives. The 198 Reserve is the most exotic (fresh pineapple, passion fruit, papaya) and floral of the trio with a great succulence that then twists into a dazzling citric freshness that not only kept drawing me back to the glass, but was also uplifting in the way that the great Riesling Spätlese wines from the Mosel and Nahe in Germany are. Not surprisingly, Bruce, Kees and Kelby are all great fans of these wines, and had them in mind. With its white peach and honeysuckle aromas the OLN is a very charming and elegant wine, the long mineral and vibrant acidity at the finish taking me by surprise. The dry 239 is the most reticent of the trio, but as a very delicate peach and fresh herbs character, is intense and concentrated, yet silky, ending with a bright lemon freshness and a salty mineral touch. I’m sure all of these wines will show even better when they are released in a few months time. All three of these 2014 Rieslings are big wines in the traditional FLX context, but already have a delicacy that is literally breathtaking. Boundary Breaks now belongs in the first league of FLX and North American Riesling producers. These wines will sell for $19 to private customers at the cellar door, which is a steal. Both because of the quality and that price I’m expecting NYWC and the rest of the nation’s wine scene to jump for them, and I will therefore be placing my order early.